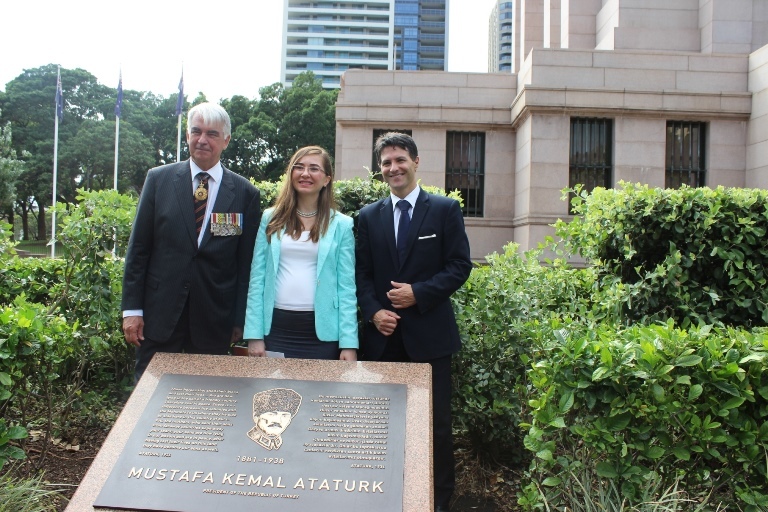 Today a ceremony was held outside the ANZAC Memorial in Hyde Park south to unveil a plaque recognising Mustafa Kemal Ataturk’s words of comfort to the Anzac mothers who lost their sons in Gallipoli in the Great War. The plaque has been erected in this location on a temporary basis in recognition of the enduring friendship forged between the people of Turkey and Australia, who fought on opposite sides of the Great War as a Centenary of Anzac Advisory Council endorsed project, with the support of the NSW and Turkish Governments. The plaque provides the text of speech written by Mustafa Kemal in 1934 in memory of the allied soldiers who fell during the Gallipoli campaign.